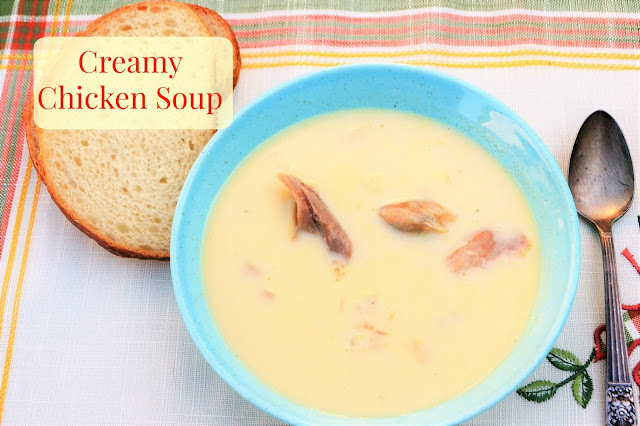 #SoupWeek continues with more great soups like, Creamy Chicken Soup. This is one of those soups that just warms your soul. It is a rich and soothing soup that just pleases everyone who has it. And the best part is, that is easy to make and easy on the budget too! Just a few minutes, a few ingredients and you have a warm soup waiting on the stove. I love to have this on the stove as an appetizer for when family or company is coming over for dinner on a chilly fall or winter evening or for a lunch with a slice of french bread. Jan's Tip: This is the perfect use for that last little bit of rotisserie chicken you have left that isn't quite enough for anything else. just save 3/4-1 cup of diced chicken pieces for this soup. Melt butter in large saucepan over medium -low heat. Add flour, whisking until smooth. cook 3 minutes, whisking constantly. add 1 cup of the hot chicken broth, whisking vigorously to blend. bring to a simmer stirring. In a mixing bowl, whisk together egg yolks and cream. Ladle 1/2 cup of the hot broth into the egg mixture, whisking slowly. Pour egg mixture back into pan, whisking slowly. Heat soup slowly (do NOT boil), addin gmore broth if too thick. Add chicken and salt and heat thoroughly.